Do you want to share your Pilates? Get the advantages and benefits of 1:1 but spread out a little. Small group Pilates may be the answer. 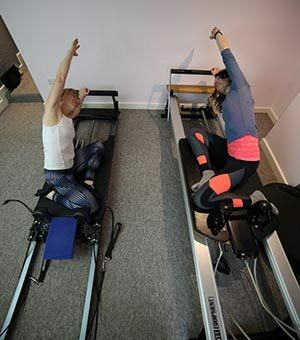 We offer matwork Pilates for small groups of 2 or 3 people. The sessions are taught by Alison and Louise in the LS8 studio. The focus of the work is shared and so is the cost. The class is still very intimate with ample time for the teacher to really be able to guide you. We can make use of extra equipment not available in the community venues, for example, the Gym Exercise Balls, Foam Rollers, Magic Circles. You will be able to arrange the session for a time that is convenient for you. You will have a personalised session, planned on the basis of the aims and goals of you and the other(s) in your group. You can discuss your specific goals and they can really be addressed within the sessions. This will mean that you can achieve your movement goals more quickly. The pace and intensity of the classes will be suited to you and if particular issues come up in the course of the class they can be addressed there and then. It is your session fter all. The cost of a Small Group Pilates session is £42 per session. Please note that for your first session (only) you are required to pay in advance. For all of the sessions, if you cancel on day then we ask you to pay a cancellation fee of £16. If you’d like to book Small Group Pilates, please use the PayPal button below. You don’t have to have a PayPal account, as you can use this button to pay using your debit or credit card too. Louise is very understanding of your pain & helps you to adjust the exercises to suit your needs. Pilates gives you confidence to use your body in the right way to move safely and more comfortably. The small intimate class is not as intimidating as a larger class – and almost one to one. I first came to Pilates Leeds because I and two friends felt we needed to improve our balance and flexibility. We needed a class which would meet our needs and times that would fit into a busy retirement schedule and family responsibilities. I contacted Alison, who I had met at her Pilates for over 50s and she arranged for us to meet with Louise at the studio. We have found the small group sessions absolutely brilliant. Louise prepares the sessions carefully, taking into account our individual needs and gently pushing us to achieve a little more each time. This makes the experience fulfilling as well as enjoyable. The improvement in posture and flexibility is measurable; I am taller! Before starting the sessions I had to use a step to connect the garden washing line, this is no longer necessary and I am able to get up from the floor without using hands. I am inspired to practise the easier moves regularly at home and the classes extend me.